LOS ANGLES - After walking the leadoff batter in the seventh on Friday, Matt Moore said he didn't deserve anything good to happen. Ty Blach certainly did a day later. 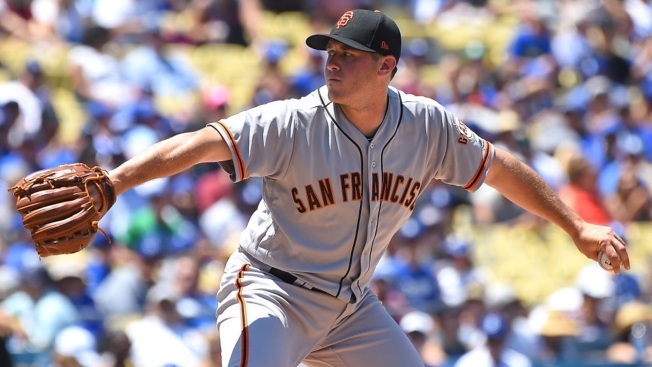 Blach was sharp against the Dodgers once again, but he got no support. The Giants fell 2-1 at Dodger Stadium, and their season series with the Dodgers is now tied six-all. -- Blach looked headed for disaster early. A double, single and two walks loaded the bases and pushed a run across, and Dave Righetti came running out. Blach made a leaping snag of Yasiel Puig's bouncer to start an inning-ending double play, and he mostly cruised the rest of the way. He outlasted Rich Hill, allowing eight hits and two earned in seven innings. -- Blach has faced the Dodgers five times and they still haven't figured him out. He's up to 30 career innings against them with just five earned runs allowed on 20 hits. Three of Blach's four starts against the Dodgers have lasted seven-plus innings. -- Hunter Pence crushed a two-strike curveball from Rich Hill in the fourth, getting the Giants in the hit column with a solo homer. He has now homered off Hill and Clayton Kershaw curveballs this season; those are two of the best curves in the game. -- Jae-gyun Hwang had an up-and-down day at first base. Cody Bellinger's hard shot got past him for an RBI single in the third, but in the fifth Hwang and Brandon Crawford turned a slick 3-6-3 double play to get Blach out of a jam. -- After 839 games in the minors, Carlos Moncrief made his MLB debut. He drew a walk. HE THEN FLIPPED HIS BAT!